For private events of 40 guests or more, contact ICLADowntownGroups@ihg.com. 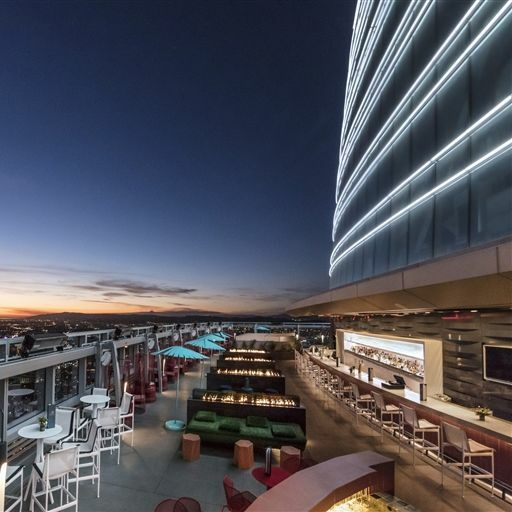 Atop InterContinental Los Angeles Downtown’s 73rd floor is Spire 73 – the tallest open-air bar in the Western Hemisphere. 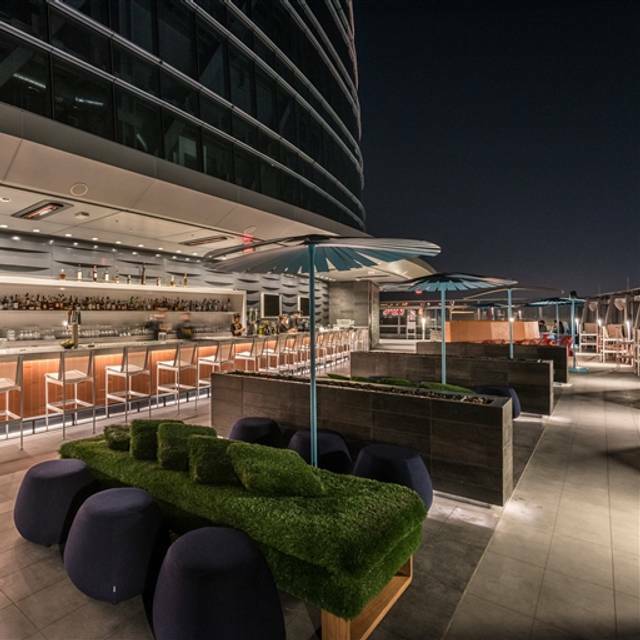 This rooftop lounge offers breathtaking views of the city, signature cocktails, a selection of whiskey, and culinary expressions to rival the view. Entry Fee*: $10 per person (Daily). $20 Friday & Saturday after 8pm. *Does not apply to hotel guests. Smart Casual Attire*: No sleeveless jerseys, flip flops, baseball caps, sports slip-ons. No backpacks or oversized bags permitted. I.D. Required at Check-In*: After 6pm: ages 21+ only. Before 6pm, ages 20 & under must be accompanied by a parent or legal guardian Outside Food & Beverage*: Not allowed. For any questions, please contact the restaurant. *Pricing does not include tax & gratuity. An 18% service charge will be added for parties of 6 or more. This place is very pricey but the view is breath taking! El mejor bar abierto en un edificio de LA. Un lugar que debe ser visitado. Vista extraordinaria. Buena comida, buen ambiente y maravillosa atención. I would recommend Spire 73 only for great atmosphere. You can get better food at other places for fractions of the price. It's all about the views. The 71st floor is also worth checking out. The pretzels were amazing....everything is priced high, but worth it. Wouldn't necessarily recommend dinner, but definitely head up for drinks and a snack. Heads up - backpacks are not allowed. I came the second week they were open and I LOVED it. I expected it to be disorganized b/c it just opened, but actually was approached by many staff to see if I wanted anything and if everything was good the entire time there. It was not a full house b/c only half of the floor was open. We ordered many items from the menu. The food was really good, but they are small bites and not meals. However, the chocolate truffle option is definitely for an entire group and a good option. The entire thing was edible. I would say that the menu needs to expand with more options in the future, but since it just opened, I was happy with what I got. It was pricey, but the views were worth it. It was absolutely INCREDIBLE and I can say I have been to the highest rooftop bar in the nation. I highly recommend this place if you are visiting LA. I would not do it for dinner, but for happy hour pre-dinner or late night after being out and you want a place to hang with good company. Slow service even for water if you have a reservation for a table by the outdoor windows. No heat lamps so best to bring a jacket if you're planning to be arriving from sunset to evening. Very limited menu. 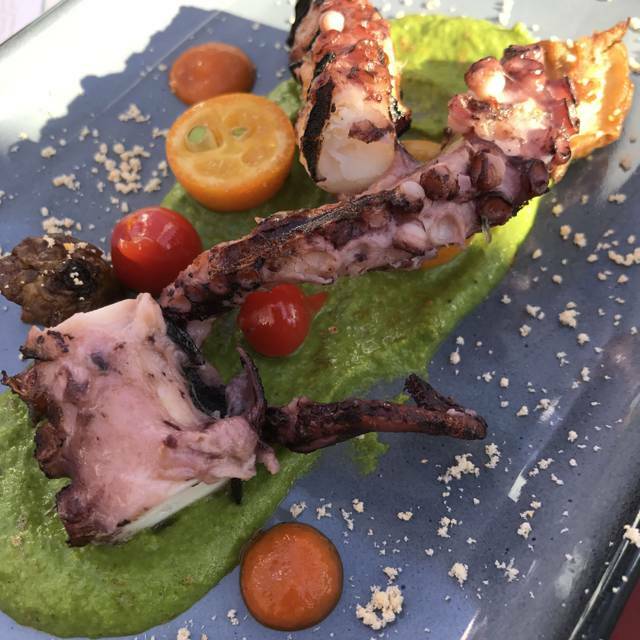 Octopus appetizer was flavorless. I'd go after dark. The city lights view is worth seeing from 73 stories up, but in daylight? Not so much.... because of DTLA smog. I'd like to know what Spire 73 aspires to be? In New York, the clientele would be called the "Bridge and Tunnel" crowd. They have not done a good job of defining themselves on their website. 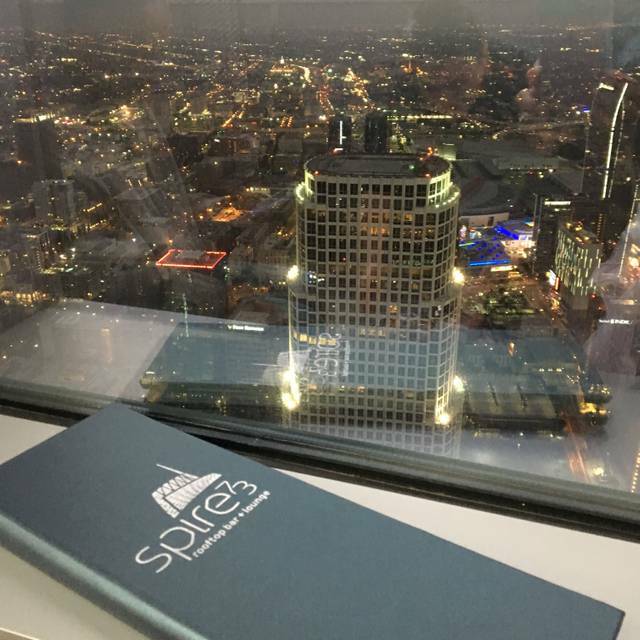 Instead of throwing the doors open, Spire 73 should have done a 'soft' launch with a series of private parties. The elevator situation is a mess for both the hotel and this lounge. I booked a reservation online. It was implied that we could have dinner. When we arrived the staff had our reservation; but the other patrons tied to take the table from us when we stood up to look out the windows. There also seems to be a maximum occupancy issue for the lounge. Two glasses of champagne and Deviled Eggs cost us $100.00. We left to go find food at the Intercontinental Hotel, but their sushi bar closed at 9pm and the poorly named main dining room was buffet only and the seating looked uncomfortable. BTW - I should mention that my friend was hung up upon by the lounge three times when he called to send a bottle of champagne to our table. He never got through to anyone who would help. This was supposed to be a milestone birthday evening. I've reschedule the celebration for this coming Friday night, Bastille Day at an inspired French cafe. Spire 73 is not Red Bird or Bastia... It is a hotel bar, minus the lounge singer. There's no need to return. The ambiance is amazing. I feel like they were ill prepared with adequate staff being so new. The food leaves something to be desired. When they say "small plates" they really mean it, they're about two bites worth of food for a ridiculous amount of money. Even neighboring diners were shocked ok how small the portions were. Opening week bugs will get ironed out, I'm sure. Need to get a host for folks like me who reserved tables. Was a bit chaotic getting up to the 73rd floor and finding someone to show us to a table. Seemed like a free for all. And drop the deviled eggs from your menu. Omg. The black squid ink is too overwhelming and leaves back stains on your teeth and mouth. Not appealing. Staff was very nice. And the view is spectacular. Like I said, grand opening chaos. Will definitely come back in a few weeks when the place is a bit more organized. New hotel plus new restaurants and bars... it will take some time to get the wrinkles out. Great outdoor bar with a younger crowd. Music level a bit loud but its outdoors and tolerable. Service is slow but hopefully they will prime up in the next coming months to make sure things are flowing. This place is open late so that's a huge positive and can always catch before dinner or after...but beware of the lines on elevator to get to the top floor. No host. Poor customer service. No bartenders were available to service us. we arrived the place with no available table. we waited for 1 hour to be seated .....we have to find our own table. Our reservation was not held, so we had to fend off people for seats. I ordered a glass of wine at $10.00 and at the time of the bill I was charged for $18.00 glass of wine. Not enough servers, so service was terrible. The place just opened but I haven't seen anything so disorganized in a long time. We had to wait an hour to put in our food/drink orders and wait another hour for those to come out. When the s'mores did, we had to send it back because the flame went out and even with a new flame we basically ate cold marshmallows for $20. I understand growing pains, but they should not have opened yet if they were unable to accommodate guests. The place is visually stunning. The view? Not sure, the west facing windows were so dirty you could not see through them...trying gave me a headache. The service is horrendous. The food portions are minute but the menu is experimental and different. Try the scallop! Not a good place for Vegans/Vegetarians. Come for the view and a cocktail and get out!